Let’s start by the most important information. Those LED lights are hand made by Tim Hardwick especially for catfishing. Those lights are robust, unique, come in a wide range of great bright colors, they can be attached very easily to your catfishing rod, they last long and…are made with passion by Tim. Package contains one light, one battery, one card, and one nylon mount tie. Submersible up to 100+ hours in water on one single battery! 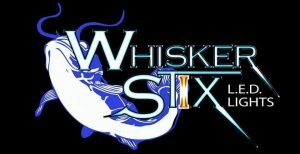 What is included when you buy a Whisker Stix LED Light? It comes with: a light, battery, mount tie and a card with Whisker Stix contact information. 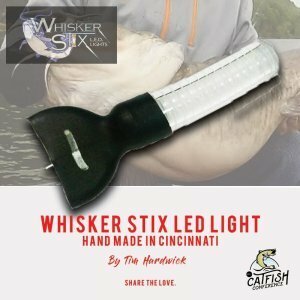 By buying Whisker Stix LED Lights for your night fishing expeditions, you’re buying a durable product and you’re supporting a local small business.